Active management investors, traders by profession, share a common trait. They are always on the look out for the latest system or approach that offers potential, but that has not been “commoditized” by the general population of traders at large. Popularity is good to a point, but avid use tends to reduce opportunities for all. The latest system to gain this type of early support is the Ichimoku indicator system. Templates are now available on most platforms, but for the active trader looking for an “edge”, there are many customized versions of this popular technical indicator that can be easily downloaded for immediate use on the popular Tradestation platform. At first glance, this amalgamation of indicators can be visually intimidating. An assortment of lines and shaded regions, referred to as a “cloud”, attempt to give the trader a composite view of the chosen pricing behavior environment. A newspaper writer and his assistants designed the system in Japan in the sixties to use primarily in the commodities and futures markets. Stock traders, both new and experienced, have recently found it to be useful in their markets as well. Traders that prefer positions that cover a few days or weeks are the primary user group, since alerts and signals are more consistent over longer timeframes. The basic system includes the “Kumo Cloud”, noted in the above chart, that represents support and resistance areas both now, in the past, and, claimed by some of its proponents, in the near-term future, a feature that requires a screen adjustment to be visible. The “Kijun-sen” and “Tanken-sen” resemble exponential moving averages, and the “Chinkou-span” is treated as a sentiment index of sorts. The latter line, based on daily closing prices, is moved 26 periods backward to give a sense if Buyers or Sellers are dominating the trading action. Senkou Span B: (highest high + lowest low)/2 calculated over past 52 time periods, sent 26 periods ahead. Kijun-sen: (highest high + lowest low)/2 calculated over last 26 periods. Chinkou Span: (most current closing price plotted 26 time periods back. Aficionados of the Ichimoku system tout numerous alerts and trading signals from the combination of indicators, but, in general, the signals relate to standard line crossings and relationships with candlestick formations. Conservative traders have learned to take what the market gives you with this technical “tool” and trust that the best trade set-ups arise when the candlesticks break out from both the cloud and the two moving averages. Patience is required, but more consistent and reliable results are accorded to the situations noted by the “red” ovals in the above chart, for both up and down trends. The strongest trading signals observed for this indicator tended to occur when longer timeframes were used, such as W1, D1 and H1 timeframes. In each case, general stop loss order sizes can be discerned from the width of the Kumo Cloud as a rule of thumb. Any crosses of the Tenkan-sen and Kijun-sen represents a change in a short-term versus a long-term indicator, similar to the technical definitions of gold and dead crosses, and signals that reversal is imminent. Many traders are not content to accept the Ichimoku system “as is”, perhaps since it was originally developed by a non-trader with little trading experience. Tinkering begins by dropping the “Chinkou-span”, perceived more as a distraction than a true indication of market sentiment. Traders may also substitute various moving averages, testing a variety of combinations that have been successful when used in other markets. Others add favored oscillating indicators to confirm various trading signals. Still others will experiment with downloadable versions of the actual programming language to find a combination or alter a calculation sequence that suits their individual tastes. The term “Ichimoku” actually translates to “one look”, the obvious objective of this combined approach to trading. Traders are given a single picture to form an interpretation, composed of a number of integrated indicators to gauge market momentum and to view the interplay of critical market variables. 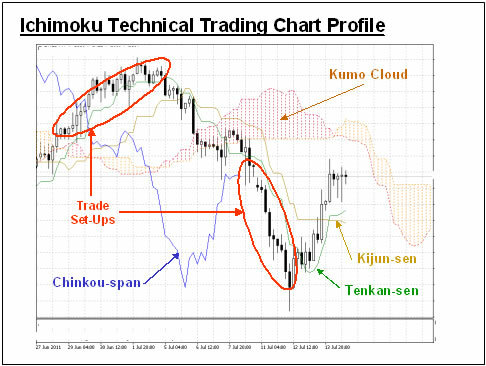 The distinguishing feature of Ichimoku is most certainly the “cloud”, supported by three additional line indicators to clarify potential trading patterns and set-ups. Longer timeframes help eliminate market “noise” and are recommended to increase the effectiveness of this trading method. Traders tend to be a fickle lot, ever searching for an “edge” to tilt the odds in their favor. The Ichimoku trading system has received a great deal of attention of late, an indication that many have found benefits in its usage, whether in its present form or customized to fit one’s tastes. As with all indicators, the past is never a guarantee of future results, but if the use of this combined approach does provide the desired “edge”, then use it for all it is worth until the next better system comes along.